Students have had the opportunity to view a special exhibition that explored the contribution made by people from the Indian sub-continent in the First World War. The exhibition gave students a fascinating insight into the British-Indian Army and its contribution to the war, in which 75,000 of its soldiers, all volunteers, died. The exhibition also links with curriculum subjects: History, English and PHSE (Personal, Social and Health Education). 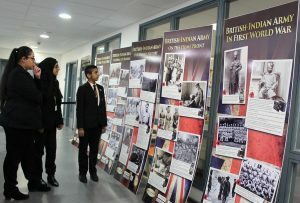 It is hoped that the exhibition has also helped to ground subject knowledge by providing students with a cultural connection to the conflict. The exhibition came about through collaboration with academy English teacher, Stuart Irving, Kirklees Interfaith Forum, Kirklees Faith Network and Waseem Riaz.